In 2011, $11 billion was spent on wedding and engagement rings in the U.S. Picking the right ring is an important part of the proposal process. It’s estimated that grooms can sometimes take somewhere around three months to find the right diamond ring for their brides. This comes to no surprise, thanks to the various diamond types, sizes, and styles that exist on the market and in jewelry stores today. 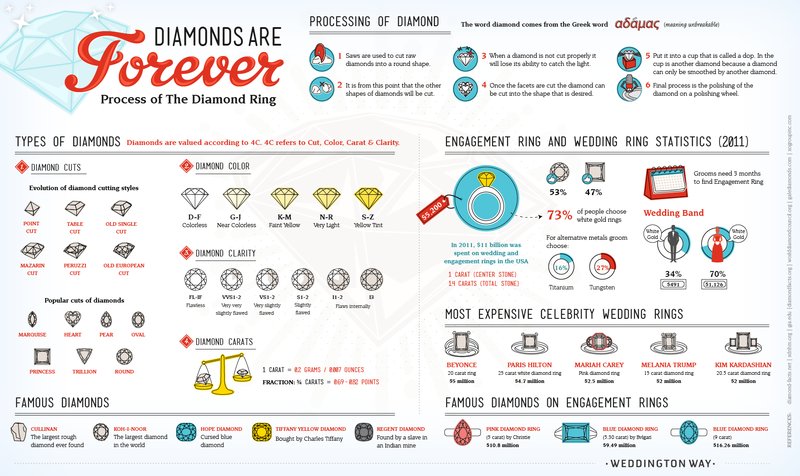 This infographic from Weddington Way illustrates how diamonds are valued (the 4 C’s), outlines the process by which a diamond is readied for sale to consumers, and sheds light on some of the most famous diamonds and wedding rings in existence.